HELLTOWN BEER: Genius, or Just Like the Rest of Us, Lucky on Occasion? Genius, or Just Like the Rest of Us, Lucky on Occasion? The man in the photo above is Gregg Berhalter. Mr. Berhalter is the coach and sporting director of the Columbus Crew. The 2014 Columbus Crew have been enigmatic, even by Arthur Dent's (The Hitchhiker's Guide to the Galaxy) standards. Take for example the three game win streak at the beginning of the season. No, really, take it; because it was, up until two weeks ago, the only real black and gold highlight of the current Major League Soccer season. That three game win streak was followed by a nineteen game stretch which included nine ties and eight losses. If you're following along and doing the math, the Columbus Crew's record during that nineteen game trek through the dark-matter filled universe was 2-9-8. 2-9-8 does not add up to 42, and so, is not the answer to the question: Life, the universe, and everything. To be brutally honest (fiction is an honest man's escape hatch in a universe gone mad with screaming selfies dripping blood), 2-9-8 is the kind of record that finds a coach floating through the space time continuum known as the National Soccer Coaches Association of America Convention. 2-9-8 coach would be shaking hands, smiling, drinking beer and trying to convince at least one college athletic director that 2-9-8 was due to the stinginess of an aloof, absent billionaire team owner. Luckily, there is always one athletic director (usually drinking alone in his hotel suite while dreaming of division 1 national football championships), who switched from beer to whiskey on the second day of the convention. This particular athletic director is willing to listen to 2-9-8 coach's desperately passionate soliloquy on the next great tactical breakthrough in the beautiful game; because, this particular athletic director is not hearing a word of 2-9-8's desperately passionate soliloquy. 2-9-8, for Gregg Berhalter, was not a firing offense (no NSCAA slobbering for coach Berhalter this winter). Gregg Berhalter is a first year coach in the single entity league known as Major League Soccer. The honeymoon for coaches in Major League Soccer is a minimum of two years. Certainly, 2-9-8 is the stepping stone to being fired during an MLS coach's second year. But, Gregg Berhalter and the Columbus Crew have done some unique things during year one of the Precourt/Berhalter era. First, they signed up with Time Warner Cable. (I won't get into this, it's not what this post is about, but there must be some beacon at the end of the stinking, rotten TWC tunnel which has yet to be set aflame) Second, Gregg Berhalter and his coaching staff have neglected to use 25% of the available salary cap this year. This decision, and its ramifications, is the motivation behind this post. Why has Gregg Berhalter and the Columbus Crew decided to forego the chance to add one or two quality players to the roster? The fact that the Crew have been competitive throughout the season, even during the 2-9-8 stretch, casts a disparaging light on the lack of quality additions to the roster. On an edition of Red Cards in Helltown I called the lack of signings "insulting." I stand by that assessment. It was clear after only 6-8 games that the Crew, under Gregg Berhalter's guidance were making significant progress in many ways. The team had adopted an attractive style of play. The team was dictating the rhythm and pace of play. The defense and new goalie, Steve Clark, were keeping games close. Many of the young players on the team were showing glimpses of quality. The one thing that was so obviously missing was a proven goal scorer. From the beginning of the season, the Crew have had the money to bring in a quality striker. $700,000 in salary cap space buys a darn good Major League Soccer goal-getter. Anthony Precourt may have needed to lay out some transfer money, but clearly, a goal every other game sort of player would have turned half of the ties during 2-9-8 into wins, and two or three of the losses would have been ties. The Columbus Crew would be at or near the top of the 2014 Eastern Division standings. Why has Gregg Berhalter not brought in the type of player who would add to the significant progress he has already helped foster? Is there some sort of genius, Ford Prefect like plan to steal the Major League Soccer equivalent of the Heart of Gold spaceship powered by the Infinite Improbability Drive? I've begun to think...perhaps there is? The first few months of the season I felt like Marvin, the Paranoid Android. Nothing could cheer me up. Losses and Ties piled atop each other. But, dammit, the stuff Gregg Berhalter was sprinkling on his team was working, he just needed a consistent striker. Where was the damn signing? Why weren't we using the $700,000 in cap space that may as well have been slowly burned two dollars every minute starting in March? I don't feel quite like Marvin, the Paranoid Android anymore. What's changed? 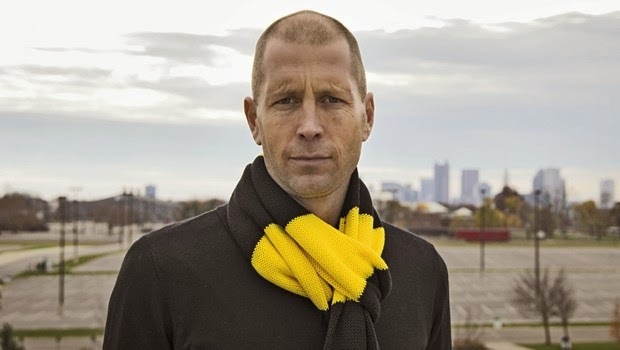 Why do I think the scarf around Gregg Berhalter's neck in the picture above is really a towel? And does he have a copy of the Hitchhiker's Guide to the Galaxy in his pocket? Has Gregg Berhalter been in possession of The Heart of Gold spaceship all along? I think...maybe so. Here's why. During the upcoming off-season two new teams will join Major League Soccer, New York City Football Club and Orlando City Soccer Club. There will be an expansion draft. Only so many players on the Columbus Crew's roster can be protected. If past predicts future, in regards to the rules for the 2015 expansion draft, the Crew will be able to protect 11 players. On top of that, the Crew's home grown players are safe. DP's, Higuain, without a no-trade clause are automatically protected. Now, take a look at who Gregg Berhalter has played this year. I mean consistently played. Clark, Parkhurst, Gonzalez (just sold, but significance I'll get to in a minute), Francis, Gehrig, Williams, Jimenez, Anor, Meram, Finlay, Higuain, Trapp, Tchani, Arrieta and now Bedell and Schonfeld. Not a whole lot of names on that list. Gregg Berhalter chose the players he felt worked best together in his possession/attacking-with-numbers system early on. He has stuck with them. Let's break the list down and see if Berhalter can protect most or all of these players in the upcoming expansion draft. Gonzalez--sold to Serie-A side. Gained a boat load of allocation money, as well as over a million for the Crew's development academy. The importance of this should not be ignored. The leap in Gonzalez's value was not Berhalter's doing, but the timing could not have been better for the Crew's future going forward. It's almost as if the Infinite Improbability Drive was engaged. That leaves 13 players who have played important minutes for the Columbus Crew this season. Gregg Berhalter can choose to protect 11 of the remaining players. Here's who he will protect. Make your own choices or reply and tell me mine are ridiculous. The list of protected players is solid. They have won some games. They have scored some goals. They defend well. This list makes up a slightly above average Major League Soccer team. Most importantly, they play well together within the vision Gregg Berhalter has of the game. If Gregg Berhalter had added two expensive players before and/or during the season the Crew would have to leave two of the above players unprotected...and those two players would surely be chosen in the draft. Why? because that list is mostly made up of young players who are just now starting to be above average Major League Soccer players. The kind of players who form the core of a title contending team. Before the 2014 season started did Gregg Berhalter envision the season playing out the way it has? Did he know that he had young players who would make huge strides as the season wore on? Did he purposely hold onto the Crew's allocation spot? Did he know that Gonzalez would be sold, thus bringing on more allocation money and the kind of payday that will allow the Crew's Youth Academy to build a more dynamic development program? Does Gregg Berhalter possess The Heart of Gold spaceship? Only Gregg Berhalter knows the answers to the above questions. Three things are certain. 1. The salary cap in Major League Soccer is going to possibly double going into next season. 2.The Columbus Crew are in a position to hold onto the core of the team during an offseason in which two new teams will strip 20 quality players from existing teams. 3. The Columbus Crew have the top allocation spot and a lot of allocation cash. You really have to give credit to Gregg Berhalter. Only one year in and he has a core of players who can compete with almost any team in Major League Soccer. He has a war chest which is guaranteed to be the envy of most coaches in the league. Two or three quality, mature additions to the group, along with one or two more youthful pick-ups and the Columbus Crew will be a team to be reckoned with for years to come. Quite possibly, besides the Heart of Gold spaceship, Gregg Berhalter has an army of dolphins at his disposal. With a trusty towel, The Hitchhiker's Guide and some black and gold clad friends he may just find the answer to the question: Life, the universe and everything. It's supposed to be 42, but I don't think it is. I think the answer will make itself known to the first person to discover the true meaning of Major League Soccer without going completely bat nuts crazy. Oh, buy my novel, Helton Janglom's Template for Life. It's on Kindle. It's got soccer, poker, kids, craziness and not a little bit of Columbus between the covers. I keep writing these blog things for free. I'm poor and I need the money. Buy the book, you ungrateful wretches.